This will result in a clean horizon that requires minimal manual editing. Our horizon was originally picked on a 50x50 IL/CL grid with picks about 1 km apart. After propagation, the horizon includes many gaps and steep dips. The propagator has also interpreted through faults that weren’t previously identified. It’s possible that our earlier manual interpretation crossed the fault plane. In section view, we can see some jagged areas in the interpretation. The propagator has left gaps when the waveform similarity dropped below the propagation threshold. Manual interpretation could be used in these areas, however the interpolator offers an efficient way to deal with them. The Interpolate/Extrapolate operation is great for filling small gaps, using a combination of nearest neighbour and inverse distance algorithms. 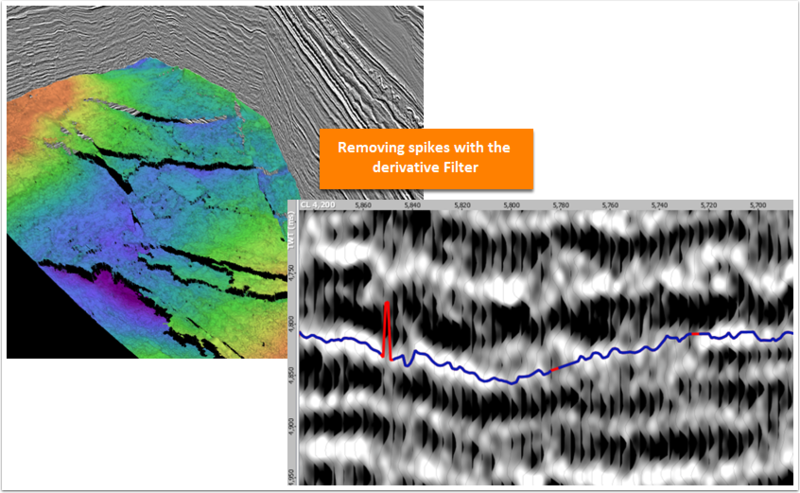 To completely fill the horizon, we used a search distance of 2000m and enabled the “stop interpolation at faults” option, to exclude areas of fault throw. Some steep areas remain, either from noisy portions of the event, or faulted areas that hadn’t yet been mapped. 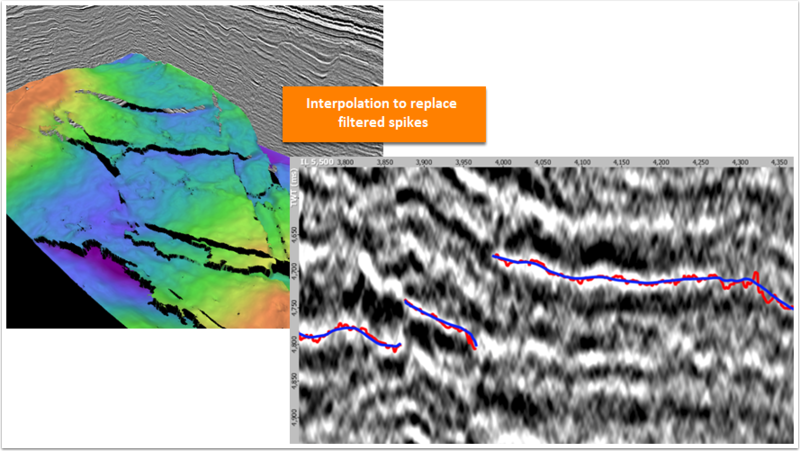 Propagating an event on noisy seismic results in a horizon containing steep spikes and dips. In some areas of poor manual picking, the propagator may have interpolated through a fault. We’ll remove the steep events from the interpretation, using the Derivative filter. In this example, we’ve used a 2 ms/trace threshold. 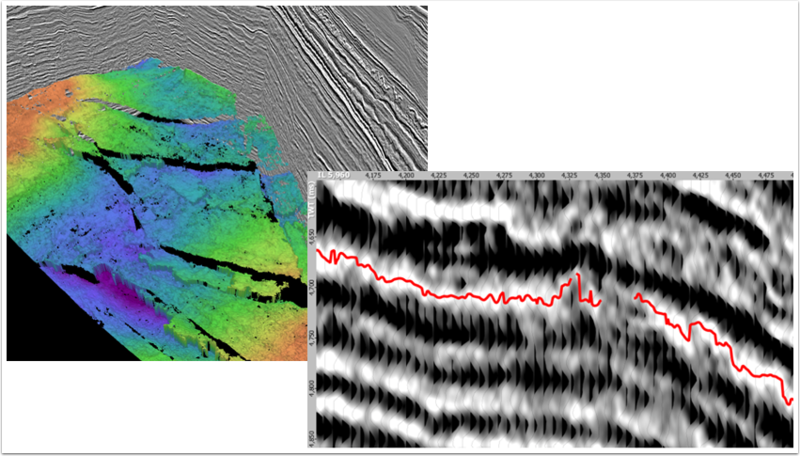 The resulting horizon (in blue), excludes the steep, non-geologic features (in red) from our earlier result. 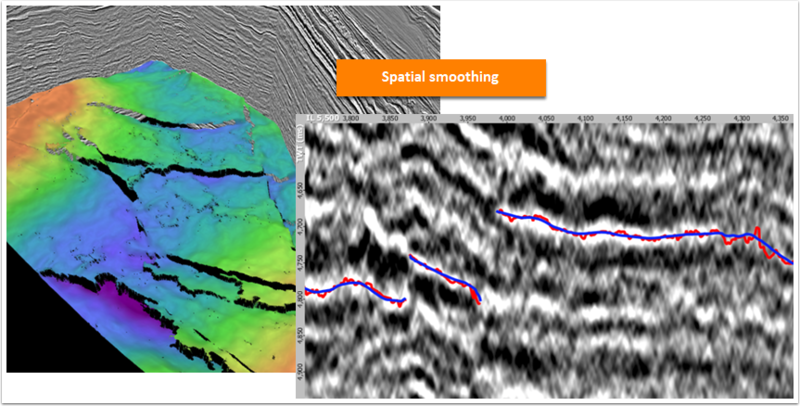 We’ll use the Smooth operation to clean the horizon, giving a geologically sensible result, unaffected by seismic noise. The smooth filter can be applied with a bias in the strike or dip directions. In this example, we used a radius of 200x200 m to remove noise and retain important structural features. The result is a cleaner horizon, which works nicely for stratigraphic flattening. Small holes remain in our horizon, so we’ll apply a second round of interpolation using the Interpolate/Extrapolate horizon operation. We’ll fill only small gaps by using a small search distance of 20 metres. The section view shows the original horizon in red with our conditioned result in blue. 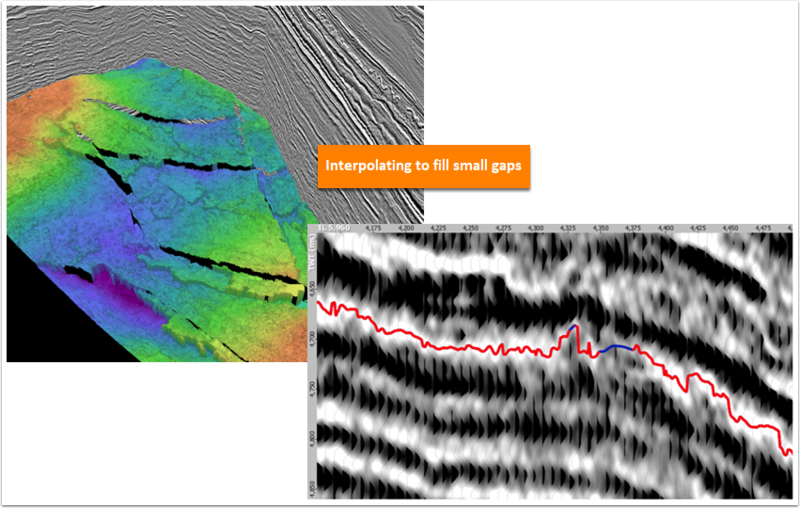 Tip: For even better results around faults, interpret fault polygons ahead of time and incorporate them into each stage of the workflow. So that’s it! With a combination of propagation and horizon operations, horizons can be conditioned to remove jagged artifacts, gaps, and steep dips. 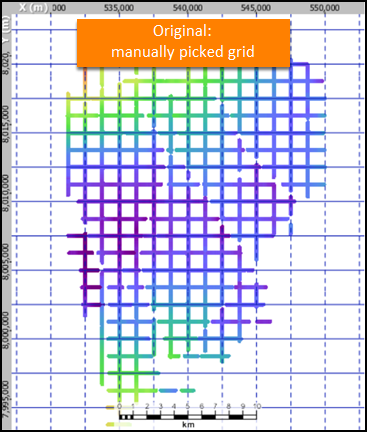 It’s easy to take horizons from a seed grid to a completed surface, requiring minimal manual editing and interpretation.